While preening Upper Street revels in its French patisseries and chichi homeware boutiques, its scrappy sibling is a proper London treasure trove, with everything from longstanding fishmongers to weathered Victorian pubs (even the odd taxidermist). Once called Lower Street (obvs), this mile-long stretch connects Islington Green with Balls Pond Road, the bottom edge of Dalston and Newington Green. Slum housing for local factory workers lined the street until the mid-nineteenth century, when it was replaced by villas and pubs, and the road quickly gained its own identity in the last century, adding a railway station in 1904 and a flamboyant art deco cinema in 1930. Although locals are still smarting from the loss of the beloved backstreet boozer The Mucky Pup (closed last March), in general Essex Road has been a safe spot for independent pubs and shops: places like Flashback and Steve Hatt’s date back decades. It’s also a great place to visit survivors of London’s Victorian pub scene. Some have been converted into izakayas, gastropubs and specialist gin bars, but the majority are still well-loved, independently run social spaces, rather than identikit pubco venues or overpriced flats. Upper Street has the houmous and babyccinos, but for after-work pints and down-to-earth fun, the only way is Essex. Pints of real ale at The New Rose, a Victorian pub that’s still an unpretentious, independent boozer. Cold Czech lager and shots of slivovitz at this north London branch of Shoreditch’s Prague Bar. Gin and tonic made obsessively well at The Lord Clyde. It’s a good place to try London-made spirits like Sipsmith and Portobello. Carpaccio, seared steaks and fried chicken at Akari, a Japanese gastropub in what was once a Victorian pub. Ceviche, risotto-style quinoa and deep-fried cassava balls with cheese at Tierra Peru, who were serving pisco sours long before everyone else got there. Wild boar with white truffle and other modern European dishes from Salut!’s open kitchen. Posh haddock and chips at Sutton & Sons, the Islington brand of a family-run chippy that also stocks bottled beer from the local Hammerton Brewery. Vinyl picked by the experts at Flashback, which has been in the music business since 1997. Sushi-grade fish, scallops and other delicacies of the deep at Steve Hatt’s fishmongers, a family business established in 1895. Denby coffee pots, antique mirrors and fireplaces, and trendy secondhand copper kitchenware at Architectural Forum. Creepy but intriguing taxidermy (by appointment only) from Get Stuffed, another family firm that’s traded on Essex Road for 40 years. Get stuck in to the pub quiz at The Old Queen’s Head, which goes way beyond general knowledge to take in ‘dirty doodles’ and ‘kazookeoke’. Winners get cash, runners-up get free booze – seems fair. Deal with hangover season over a bloody mary and draughts at Wenlock and Essex. 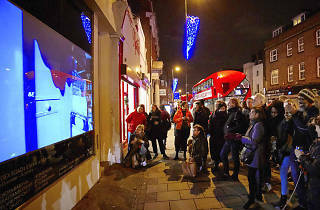 While everyone else is putting up Christmas lights and festive shop windows, Tintype gallery has bigger ideas. 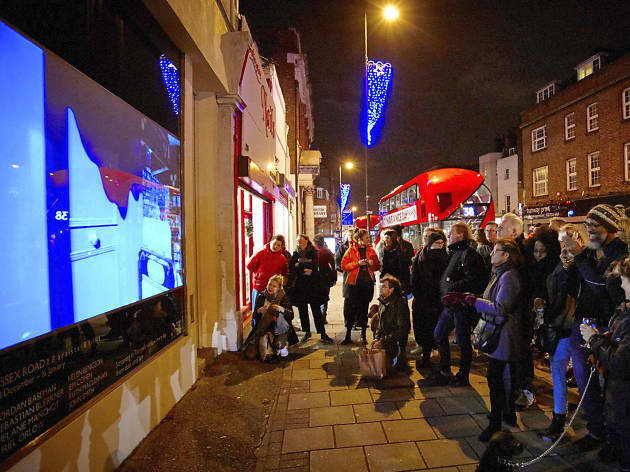 Until January 14, watch art films in their window every night until midnight. Now go out and discover more of London’s best bits.